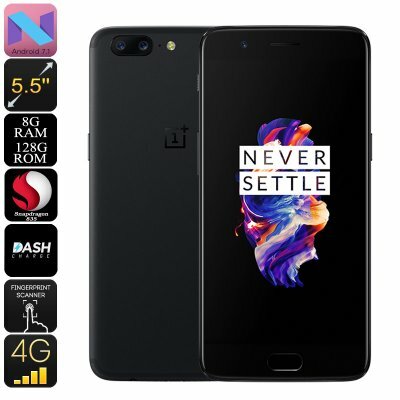 Successfully Added OnePlus 5 Android Phone - Snapdragon 835 CPU, 8GB RAM, 20MP Dual-Rear Cam, Android 7.1, Bluetooth 5.0, 4G to your Shopping Cart. OnePlus has built itself a reputation throughout the years for delivering high-end smartphones. Their latest Android phone is certainly not an exception. It runs on the Oxygen OS that has been based on the latest Android 7.1 operating system. This allows you to enjoy an exceptionally smooth user experience. You’ll be able to take on the latest and most demanding software Applications. Nothing is too much for this Android phone. With Google Play support, you’ll be able to download all the media of your liking. The phone features 128GB internal storage. Thanks to this, there will be plenty of space for you to store all your files. With its Fingerprint sensor, you’ll be able to securely store all these files and easily access them with the touch of a finger. Under its hood, the OnePlus 5 Android phone packs the Snapdragon 835 CPU. This Octa-Core processor has been clocked at 2.45GHz. It is capable of providing you with an exceptionally powerful yet energy efficient user experience. Along with its 8GB of RAM, this Android phone allows you to tackle the most demanding software. It furthermore brings along great multitasking possibilities. Nothing is too much for this latest Android phone thanks to its state of the art hardware that has been packed within its sleek body. On its beautiful 5.5-Inch Optic AMOLED display, you’ll be able to enjoy all media in stunning 1080p resolution. You’ll be treated with crisp details and vivid colors. Whether you’re watching a movie or playing a game, from now on you’ll always undergo a mesmerizing visual experience. Your display comes with Corning Gorilla Glass 5. Thanks to this, you won’t have to worry about accidentally scratching your screen or breaking it while bumping into something. The phone furthermore packs a whopping 3300mAh battery. This cell lets you enjoy all it has to offer for hours in a row. Additionally, your phone comes with a breathtaking 20MP Dual-Rear camera. This professional piece of equipment lets you shoot 4K video and breathtaking photographs no matter where you are. The OnePlus 5 comes with a 12 months warranty, brought to you by the leader in electronic devices as well as wholesale electronic gadgets..